There are three specialized audio filters for different applications and one filter-design program. All these programs need the Matlab Compiler Runtime (MCR) to be installed. 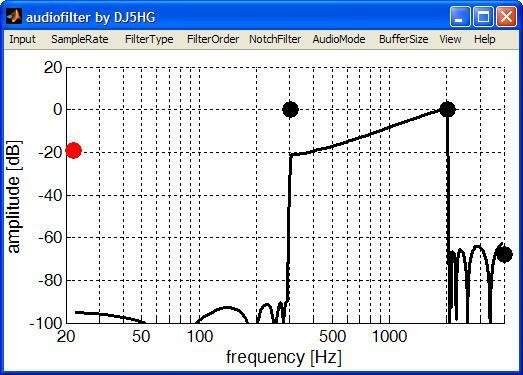 Audiofilter is a simple digital filter of IIR-type (infinite impulse response) running on a PC with soundcard. The filter coefficients are generated in realtime from the user-defined filtershape. Two black markers define the passband. They can be shifted with the mouse while the left mouse button is pressed. The black marker to the right sets the stopband attenuation. The red marker to the left is for tilting the passband. Changing the filtershape does not interrupt the actual filter process. The human ear-brain-system is very well designed. A human can concentrate on a weak CW signal in a large noisy bandwidth. Thus,the gain in audibility is by far not as large as the reduction of the SNR makes believe. But in the case of an aurora signal there is no tone to concentrate on. That may be the reason for a significant gain of a filter matched to the specific situation. 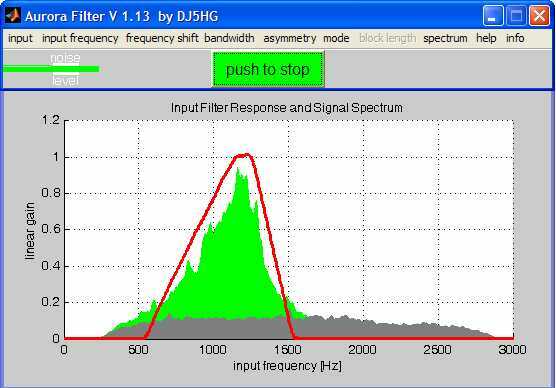 10 s original signal (bandwidth 1000 Hz), 10 s triangular filter shape, 10 s non-linear filter (applied to the same signal). CW_Filter is a digital bandpass filter running on a PC with soundcard. It is designed to support human reading of CW-signals. It offers 35 different bandwidthes from 1000 Hz down to 0.5 Hz in a logarithmic scale and two different shapes. The stopband attenuation is better than -120 dB. There also is an integrated pitch-shift and many further features. The CW_Filter.zip contains the program CW_Filter.exe and a UserGuide.pdf which also includes some backgound. 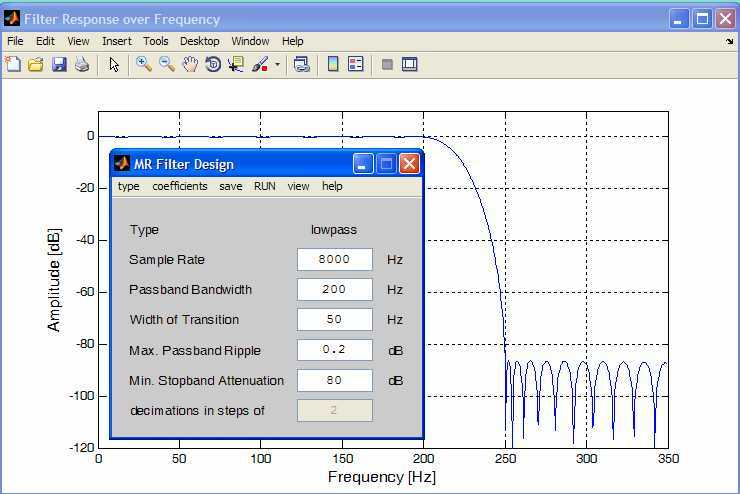 A multirate filter is a digital filter that uses a series of filters which are computed at different sample rates. This allowes the design of filters which reach the demands with minimal computational effort at runtime. The CW_Filter above is an example. There is no additional user guide in the following *.zip-file. But there is a help option in the program's user interface. The program also has the option to test the generated filter via the soundcard.